Did you see the news item last week about the UK baby born with two front teeth? Premature tooth eruption is something of a rarity, occurring about once in every couple thousand births. But unless it’s linked to some other medical condition, it’s usually not of much concern beyond the discomfort it can cause a breastfeeding mother and the risk of choking, should the teeth come loose early, as well. This last point might make you wonder: Why do we lose our first teeth at all – those “baby teeth” or “milk teeth,” as most people call them but which dentists call “deciduous” or “primary” teeth? Why do we have two sets of natural teeth in our lifetimes? Deciduous teeth are considered essential in the development of the oral cavity by dental researchers and dentists. The permanent teeth replacements develop from the same tooth bud as the deciduous teeth; this provides a guide for permanent teeth eruption. Also the muscles of the jaw and the formation of the jaw bones depend on the primary teeth in order to maintain the proper space for permanent teeth. The roots of deciduous teeth provide an opening for the permanent teeth to erupt. These teeth are also needed for proper development of a child’s speech and chewing of food. Since the infant human skull is too small to hold a full set of adult teeth, the 20 primary teeth serve as sort of placeholders until the jaw and skull are developed enough to hold up to 32 permanent teeth. As they make way, the primary teeth become loose and eventually fall out. Many cultures have traditions marking this rite of passage – an important developmental step on the road to adulthood. In some Eastern societies, the baby tooth is thrown in a symbolic direction while making a wish. In the West, we have the Tooth Fairy and similar figures for whom children leave their teeth under their pillow, in a glass of water or even buried in the ground, and expect money or some other gift in return. Judging from the sheer number of online discussions about the matter, it seems that the money question – “How much?” – causes parents no small amount of worry. According to Delta Dental of Minnesota’s last poll on the matter, amounts vary widely. While, nationally, the average was $2.13 per tooth, this included a low of 5 cents per tooth and a high of $50 (!) per tooth. (Rates can be tracked on DDM’s website devoted to the matter.) At least one parenting blogger has done her own poll, which showed a little lower overall average: $1.15 per tooth, with a top rate of $5. Start your own family traditions by leaving a little glitter or confetti under their pillows, alongside some coupons for a special treat or a movie. If either of them likes to draw, art pencils or markers could be fun. Small electronic games, tiny cars or planes, puzzles and the above suggestions are other fun ideas. It can be whatever you feel would be a unique token of your love and caring. It’s nice to make the event special but don’t worry about making it perfect. Just have fun with your children. 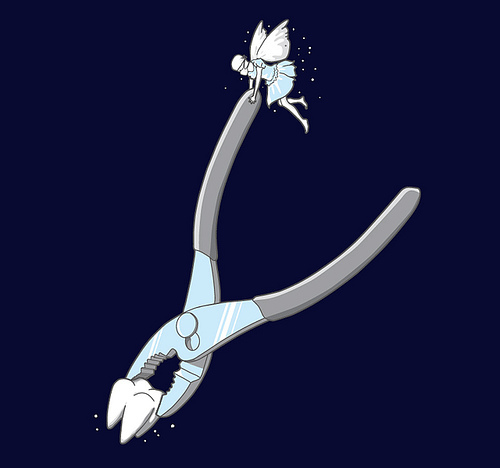 But what if the Tooth Fairy forgets to stop by? There are some creative tips out there for finessing that situation, as well. So, how about you? 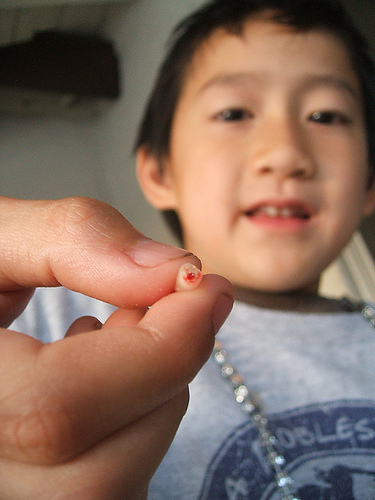 What traditions did your family have when you were a kid and lost a tooth? What did the Tooth Fairy leave for you? If you have kids and a Tooth Fairy who deals in cash for teeth, how much does she pay? Or does she offer something other than money? If you’ve missed a visit, how did you cover up for it? I encourage you to share your own experiences and opinions in the comments. Comments Off on Why Do We Have Two Sets of Natural Teeth in Our Lifetimes? What Does a Smile Say? The human smile sets us at ease. People who don’t smile openly are considered unapproachable, unlikeable and even dangerous. Yet the same expression by an animal signals danger. Why does it signal safety when we humans smile? Charles Martin DDS, of the Richmond Smile Center, decided to find out. Smiling, as it turns out, is related to sound, according to research by John J. Ohala, Professor Emeritus in the Department of Linguistics at the University of California, Berkeley. Ohala discovered that words sound better to humans when accompanied by a smile. 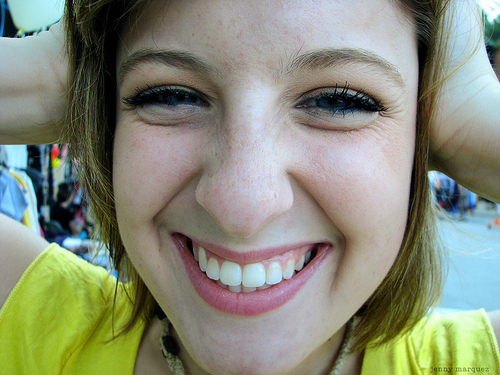 A smile gives the speaker’s voice a higher pitch. Humans associate lower-pitched voices – like those of larger, more threatening animals – with danger, while higher voices are typically found in smaller animals. Over time, the visual cue of a wide smile has become connected with the sound of a higher pitched voice. Therefore, a smile conveys an absence of danger. Though adults don’t respond as strongly to higher voices and smiles, we do tend to gravitate toward a smile. In fact, the sound of a voice accompanied by a smile is now so firmly ingrained in the human subconscious as safe and cheerful that a smile alone can make us feel good about someone. Adapted from a Richmond Smile Center media release, via PRNewswire. Hooray for the Costa Mesa City Council for taking a stand against mercury fillings. May other cities here in California and beyond follow their lead. Costa Mesa, California has become the first city in the United States to call for an immediate end to dental amalgam, the controversial filling material that is 50% mercury. Voting 5-0 on 19 October 2010, the Costa Mesa City Council adopted the resolution (PDF) sponsored by Councilman Gary Monahan that (1) calls on federal and state agencies to eliminate amalgam, (2) asks dentists in Costa Mesa to cease using mercury and switch to non-toxic alternatives, and (3) requests that the other 33 cities in Orange County join Costa Mesa in opposing dental mercury. While as a resolution, it does not actually ban amalgam, it is an important step toward ending this health and environmental scourage. The watershed Monahan Resolution is the first success for Californians for Green Dentistry, a new project of Consumers for Dental Choice. Californians for Green Dentistry has a trio of dedicated leaders: Director Anita Vazquez Tibau spearheaded the strategy leading to this resolution along with dental hygienist Marisa Russo and naturopath Kristy Mills. Since July, our hardworking California volunteers distributed handouts alerting the public to the problem of dental amalgam, gained the support of numerous local health professionals and businesses, and collected hundreds of signatures on petitions to city council. In response, the Costa Mesa City Council granted us the hearing to address dental mercury. At the city council hearing, our talented team – including dentists, health professionals, injured consumers, scientists, advocates, and even former Californian Dental Board member Dr. Chet Yokoyama – offered poignant testimony calling for a ban on dental mercury. Our story is told by video that can be viewed by clicking here, and dentist Dr. Jim Rota’s compelling testimony can be viewed in full by clicking here. We also made the front page of the local news, which can be read online. It’s time to take this primitive and polluting mercury product off the market, and we can start in the trend-setting state of California! If you are a Californian and want to join the Californians for Green Dentistry team in the fight against dental mercury, please write Anita and me at announcements@toxicteeth.org. Let us know your name, home county, and home city. No matter where you are from, please thank Costa Mesa Councilman Gary Monahan for standing up to protect our communities, and especially our children, from dental mercury. He can be reached by email at gmonahan@ci.costa-mesa.ca.us. Earlier this week, we got a reminder from Charlie Brown of Consumers for Dental Choice that the online commenting period is open for FDA’s December hearings on mercury amalgam. More info – along with some fascinating history about opposition to mercury in medicine – is below in Charlie’s letter. Sometimes we must all pause and ask: Why do the pro-mercury dentists resist change so vociferously? Why do these protectors of a primitive, polluting product put quick-and-easy profits ahead of patient health, the environment, and worker safety? It’s tempting to say such resistance is unprecedented. Last week, I toured the National Museum of Civil War Medicine in Frederick, Maryland. While at the museum, I bought its book about Civil War medicine: Death in the Breeze by Bonnie Brice Dorwart, M.D. Mercury’s use was so prevalent, and even then so controversial, that the author devotes two chapters just to mercury – prescribed by physicians in that era to treat soldiers for dysentery, typhoid, malaria, pneumonia and syphilis. Some physicians opposed pushing mercury onto unsuspecting patients. In fact, an early hero of the mercury-free movement was none other than the Surgeon General of the United States himself, William A. Hammond. Realizing that mercury should have no role in medicine, Hammond courageously issued General Order #6 on May 4, 1863, banning its use by Army physicians. But by issuing an order to protect soldiers from dying from mercury toxicity, Hammond signed his own political death warrant. Immediately, the medical establishment started calling for his ouster. The American Medical Association assigned delegates from every state to work against Order #6. On August 18, 1864, the AMA’s smear campaign succeeded: Surgeon General Hammond was court-martialed and cashiered out. Future generations not only will condemn the American Dental Association for implanting a neurotoxin into the human body, but no doubt they will resent cleaning up after the irresponsible dentists who polluted our planet with mercury. However, like Surgeon General Hammond, we now have the opportunity to stand up publicly against mercury abusers. Then it was the medical establishment; today it is the dental establishment. Any other concerns relating to mercury fillings. You might want to tell FDA, too, that the American Medical Association did all that it could to protect mercury in the 19th century, endangering countless lives. Now the ADA is doing all it can to protect mercury in the 21st century. Will FDA stand up to the American Dental Association like Surgeon General Hammond stood up to the American Medical Association, or will FDA continue to defend mercury implanted in children’s teeth? To learn more about the public comment process, see the FDA info page on comments. Most fashion trends seem to come and go pretty quickly, but not tongue piercing…much to the dismay of parents and dentists. For tongue piercing can cause a number of dental problems, starting with infection, which can spread to other parts of the body via the bloodstream. Occasionally, such an infection can spread to the brain, killing the patient. More common are gum problems and broken teeth caused by the habit of playing with the piercing – flicking the tongue around the oral cavity, hitting both teeth and gums. This repeated trauma can damage the periodontal tissues and crack or break the teeth. Recently, a case report surfaced that illustrates another potential risk of the playing habit: orthordontic problems. The study, published in the Journal of Clinical Orthodontics, described the case of a 26 year old woman who repeatedly played her piercing against her upper front teeth. 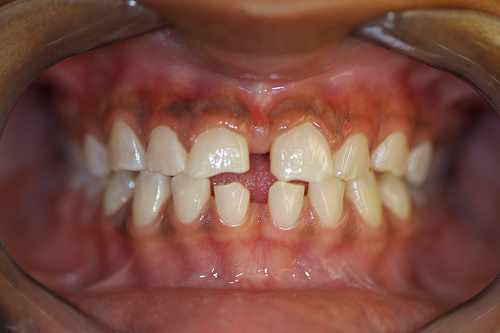 By the end of 7 years of pushing the stud up and against her front teeth, a significant diastema – a gap between her front teeth – had formed where none was before. The barbell is never removed because the tongue is so vascular that leaving the stud out can result in healing of the opening in the tongue…so it makes perfect sense that constant pushing of the stud against the teeth – every day with no break – will move them or drive them apart. Thanks to orthodontic treatment, the patient’s smile was restored to its original, non-gappy look. When people ask how I became a holistic dentist, I like to tell them that I was born into it. 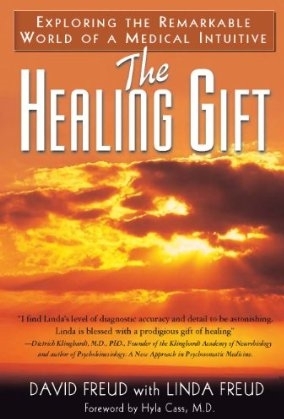 My mother was committed to natural health and holistic living, so that was the environment I grew up in. Eating a nutrient-rich, whole foods diet, getting plenty of physical activity, balancing work and play – these were the norm. It was only natural, then, that holism would inform my work as a dentist. So I practice what I preach (and what was preached to me), so to speak, and encourage my staff to do the same. After taking a recent nutrition seminar, for instance, all of us in the office adopted the detox diet we’d learned about. No, detox isn’t just for those who show symptoms of illness. After all, we live in a toxic world. Even if you make all the best, most healthful choices, you’re still exposed each day to countless pollutants through each breath you take. We can all benefit from detoxing now and again, coming away, as my staff and I did, with renewed energy and a heightened sense of physical well-being. Once upon a time, many used to think that nutrition was beyond the scope of dentistry. Only holistic and biological dentists commonly offered nutritional counseling as we helped chronically ill patients heal from the effects of mercury fillings or other toxic dental materials, focal infections or cavitations. But as many conventional dentists are finally starting to see, nutritional counseling and support can and do play a part in general dental health, as well. And it’s not just about avoiding sugar so you don’t get cavities. It’s also about how key nutrients such as minerals, antioxidants and Vitamin D support strong teeth and healthy gums and bone. What’s more, not only does a good diet help prevent tooth decay. It can even reverse it once it’s begun. It’s important to remember that your teeth aren’t just solid, static structures in your mouth. They’re living organs – just as your liver, lungs and heart are living organs. Under the hard enamel covering each tooth is the dentin. It consists of miles – yes, miles! – of microscopic tubules containing fluid and cellular structures. Below that is the pulp, which is made up of living connective tissue and odontoblasts – cells that create dentin. Both dentin and pulp are also rich in nerves, which is why your tooth will start to hurt when there’s deep decay or other damage. The chemical analysis of the saliva revealed a marked improvement which progressively increased. At the beginning of the test the average for the group showed a very low factor of safety, so low that we should expect tooth decay to be active. In six weeks, the average changed to a condition which we should expect would be accompanied by a cessation of tooth decay. The saliva factor of safety continued to improve for five months at which time the program was discontinued for the summer. Several incidents of special interest occurred. Two different teachers came to me to inquire what had been done to make a particular child change from one of the poorest in the class in capacity to learn to one of the best. Dental caries is only one of the many expressions of our modern deficient nutritions. When enamel is poorly formed and the diet isn’t adequate, enamel dissolves and decay sets in. Tooth decay is an opportunistic infection that takes advantage of poorly built or maintained teeth. If the diet remains inadequate, the tooth has to be filled or removed, or the person risks more serious complications. Since the days of John Hunter it has been known that when the enamel and dentine are injured by attrition or caries, teeth do not remain passive but respond to the injury by producing a reaction of the odontoblasts in the dental pulp in an area generally corresponding to the damaged tissue and resulting in a laying down of what is known as secondary dentine. 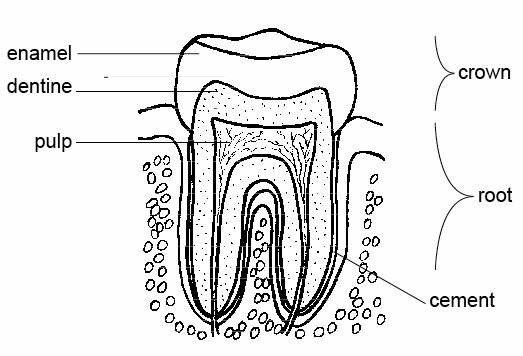 In 1922 M. Mellanby proceeded to investigate this phenomenon under varying nutritional conditions and found that she could control the secondary dentine laid down in the teeth of animals as a reaction to attrition both in quality and quantity, independently of the original structure of the tooth. Thus, when a diet of high calci­fying qualities, ie., one rich in vitamin D, calcium and phosphorus was given to the dogs during the period of attrition, the new secondary dentine laid down was abundant and well formed whether the original structure of the teeth was good or bad. On the other hand, a diet rich in cereals and poor in vitamin D resulted in the production of secondary dentine either small in amount or poorly calcified, and this happened even if the primary dentine was well formed. The hardening of carious areas that takes place in the teeth of children fed on diets of high calcifying value indicates the arrest of the active process and may result in “healing” of the infected area. As might be surmised, this phenomenon is accompanied by a laying down of a thick barrier of well-formed secondary denture… Summing up these results it will be clear that the clinical deductions made on the basis of the animal experiments have been justified, and that it is now known how to diminish the spread of caries and even to stop the active carious process in many affected teeth.